High-performance athletic surfaces can benefit from a data-driven approach to management that increases field safety and performance by adding precision. Data-driven management of natural grass athletic fields adheres to playing surface quality and safety performance guidelines established by the Australian Sports Turf Institute for cool-season natural grass athletic fields. High quality athletic fields should inherently be safe for play. Surface hardness is a primary measure of field quality and safety and should be maintained to provide desirable ball-surface interaction and limit risk of head injury. Surface hardness is measured using the standard three-drop method with a Clegg Impact Tester. A weighted missile is released from a uniform height and measures the change in acceleration at surface impact. 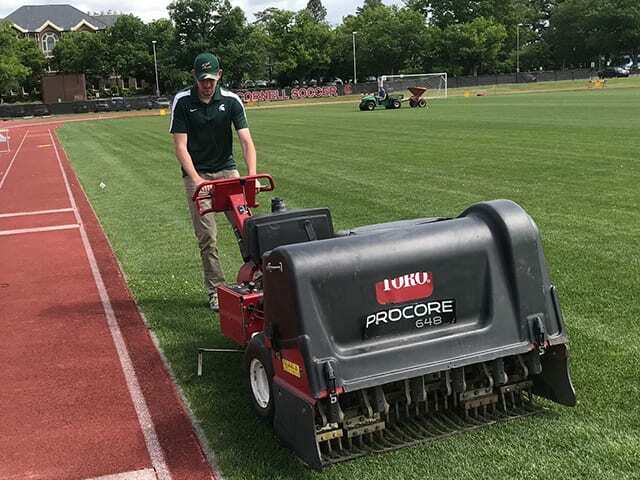 The Cornell University Turfgrass Program has worked closely with Cornell Athletics to train students interested in working in the the sports turf industry. A recent student project monitored surface hardness weekly during the 2018 Spring/Summer playing seasons. Measurements indicated a localized area of surface hardness where readings exceeded head-injury threshold levels. 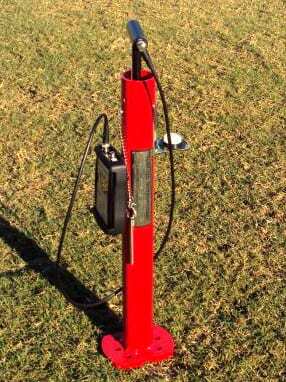 Therefore, a localized decompaction system was implemented using a Toro 648 Procore fitted with ¾’’ solid tines followed by topdressing sand that filled open channels using a Dakota 310 Turf Tender. High quality topdressing material is important and should reflect the surface modification goals. This application used a clean, uniformly graded sand consisting of particles in the medium and coarse size fractions. The uniformity coefficient (Cu) of the topdressing sand tested at 2.5. The lower the Cu, the more uniform the particle size and the greater the compaction resistance. Applying sand topdressing with Dakota 310 Turf Tender. Measurements were taken before, during and after the decompaction process. Before decompaction, 10 of 12 measurements collected from localized areas totaling 7500 sq ft had surface hardness readings above head-injury thresholds of 120 gravities. Following decompaction all 12 measurements were reduced on average by 30 percent and fell within the preferred range for safe play. Furthermore, the standard deviation (differences among initial measures) dropped by 40%, indicating a more consistent playing surface following decompaction. This project demonstrates how high-performance athletic surfaces can benefit from a data-driven approach to management that increases field safety and performance by adding precision. 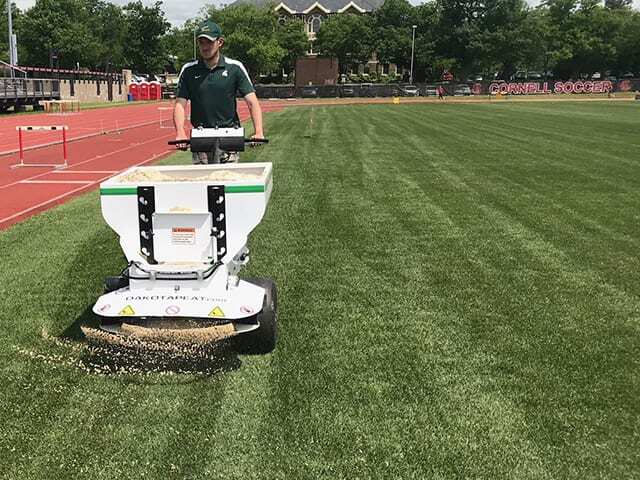 This work was conducted by our 2018 Sports Turf Research Intern, Rhys Moeller (former Varsity Soccer player for Cornell University), Josh Fontaine Sports Turf Field Research Manager, Chris Sitko Sports Turf Graduate Research Assistant, Carl Schimenti Cornell Turfgrass Program Manager and Frank Rossi, Cornell Turfgrass Program Leader. Chinch bugs, cytokinins, join us for our next Walk and Talk hosted by WNYGCSA in Fall. Excess moisture fueling stress, hindering recovery. Water deep to enhance fertilizer effectiveness and seed germination.